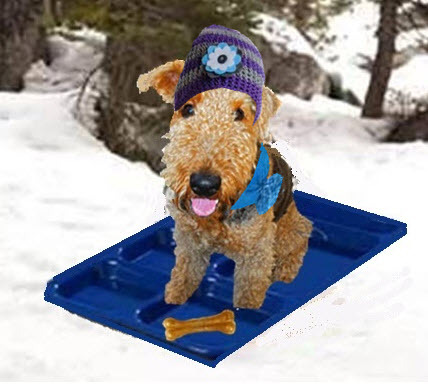 Ruby the Airedale: Sled Day! Oh puppers and kittehs, it is a funtastic day today ~ SLED DAY!! Isn't it pawsome?! OMD! And, lookie at the extra bone Sarge puts on my tray ~ he just knew I needed some extra somethin' to ease my nerves and give me extra zing for all the runs down the hill! And look at the fantastic Hat!! Oh, I loves it so much!!! You did a wondrous job Sarge!! Thanks Bunches!! I heard there was gonna be all kinds of funs today, I can't wait to see what Sarge has in store..... WHAHOO!!!! Hey Roo, I'll share my snack with you!! Rubie, you are so smart to bring a snack for the trip down the mountain! thats great, you can eat bones all the way down the hill!! Very smart!! Good call on the snack! Sarge sure knows how to have a sledding party. Race to the top of the hill! OH GRRRRREAT... you and Madi BOTH did chews the cafeteria tray model!! THAT makes US very much happy beclaws when Sarge's MOM was in college.. her whole Dorm used to... PROCURE cafeteria trays.. every time it snowed... It was a campus tradition. Yours looks super fast.. And I see that you were sure to wear some lovely winter gear to keep warm. Ernie wants to know if you want to race him down again??? Ruby girlfriend you look absolutely fantastic in that stylin' hat the colors are purrfect with your furs. How about joining me at the lodge fireplace for a hot toddy and some biscuits. BTW: Watch out for that big oak tree! It's taking a real beating today. BWAR HAR HAR ahem. Ruby you look beautiful on that sled!! I bets you are AMAZING at sledding in the snows, have an absolutely fantastic day!!! Ruby-great idea but bad execution. Only ONE treat? Oh My Dog, Ruby those colors go so well with your furs, now get ready for some fun, come on we are gonna run Goose into a biig snow bank! You don't have to wait until you get to the bottom to enjoy the food! You can load up and eat on the way down. That's a great idea! Saw you on the slopesRuby...That bone must have done the trick cause you're lookin like areal pro now...Those trays iz really fast...Sled Day is so muchfun! You look so cute in your winter gear!!!! Happy sled day! We'd love to go sledding, but all we have is mud and the sled doesn't slide in it. It just gets stuck. Looks like there's a lot more room for treats on that sled! That's a wonderful picture and great that you get a treat to go with it. Have an awesome day! Sledding AND treats - what a pawfect combination! Ruby, you look adorable! Sled Day was so much fun seeing all of our friends decked out for snow and taking to the slopes (or hills)! We had lots of fun checking out everyone sledding! You look too cute in your gear, Ruby! You look adorable in your hat, Ruby! Have a great time sledding! What a neat looking sled, Ruby! And you look so cute knit hat! !